Discover the best Phuket restaurant recommendations from our experts. Thai cuisine is not only diverse and delightful, but also extremely healthy. All dishes include some crunchy vegetables and spices. Being a beach destination, fish and seafood naturally play an important role in Phuket’s kitchens so if you love seafood, this is just the place for you! Be careful not to order spicy dishes – what is mild for Thai people can quickly reduce others to tears! To ensure that you have access to only the best on these glorious Thailand beaches, here are our Phuket restaurant recommendations. Simple, quick, economical and delicious – it’s no wonder that Pum restaurant on Patong Beach is a roaring success. So much so that there are now branches in France and England! Dig into classic Thai home-style cooking prepared right in front of you. This is also a popular meeting place for locals and visitors. At the Thong Dee The Kathu Brasserie, savor delicious Thai, French and Italian meals in a relaxed ambiance with live jazz music for company. The Pad Kee Mao spaghetti with Thai whiskey, seafood and chili is a must-try. Apart from fish and seafood, there are also plenty of vegetarian options and a special menu for children. Climb aboard a raft and drift to this charmingly traditional Thai-style restaurant which is set on an island in the middle of a small lake. On the menu are refined Thai dishes prepared with the freshest local ingredients from the kitchen garden by chef Anongrat Meklai. Black Ginger also boasts a wonderful selection on international wines to pair your food with. Together, the ambiance and food offer interesting insights into Thai food and culture. 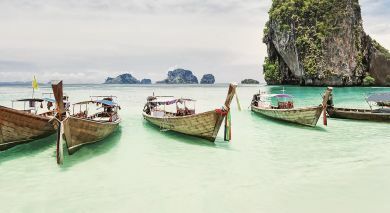 Phuket is not just a holiday paradise for sun-worshipers – gourmands will love their time here. Your personal Travel Consultant is happy to share Phuket restaurant recommendations and we will gladly reserve a table for you.